It’s always hard to get around the show floor on the public day. Between noon and 12:30, which are peak show hours, I tried to hit as many booths as possible to see how the lines were fairing. Walking from hallway to hallway is difficult and exhausting, so I might have missed something! If so, please add to the comments below. Here’s a view of one of the main halls. Here’s the wait time at the Sony booth. By noon, Sekiro and Kingdom Hearts III weren’t allowing anyone else in line, because the wait was so long. The little yellow tags say the lines for those games are currently closed. One Piece World Seeker’s wait was 80 minutes, Fortnite was 30 minutes, Devil May Cry 5 was 100 minutes and Dead or Alive 6 was 15 minutes. Lots of interest in Project Judge. When I took this photo the wait for Dragon Quest Builders 2 on the PS4 was 130 minutes, while it was 120 minutes on the Switch. However, a moment later, the staff changed the wait to 140 minutes for each of them. The wait says 80 minutes. Granted, there were only PCs running Fortnite and each demo lasted around 20 minutes. The wait for the new Inazuma Eleven game was only ten minutes. 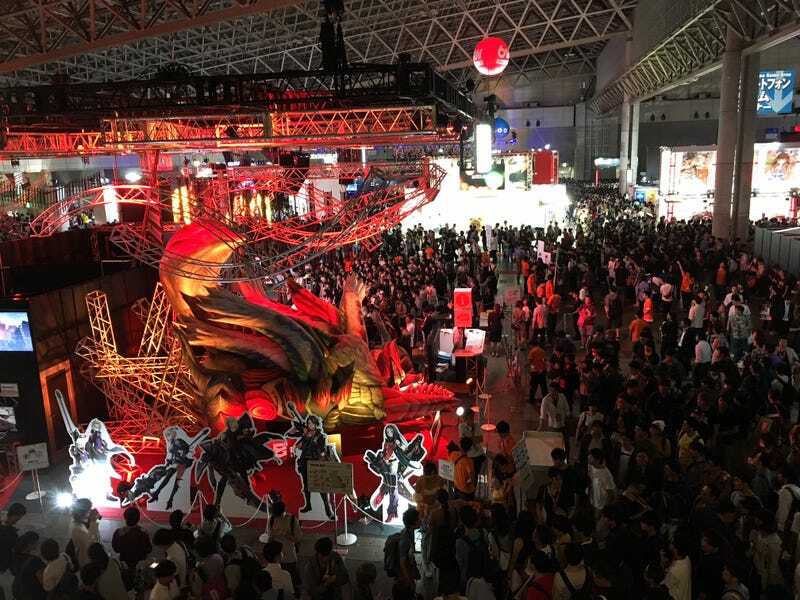 The first Level-5 Tokyo Game Show booth in several years. Of course there was lots of interest in the Resident Evil 2 remake. Here are people lined up to get on a waiting list. A huge crowd gathered around the zombies at the Capcom booth. A thirty minute wait to take a photo in PUBG gear. Mega Man 11 is popular. The wait for Ninjala was 105 minutes. Those who participated in the demo, I believe, could get prizes. A thirty minute wait for Yokai Watch 4. A 120 minute wait for Jump Force.